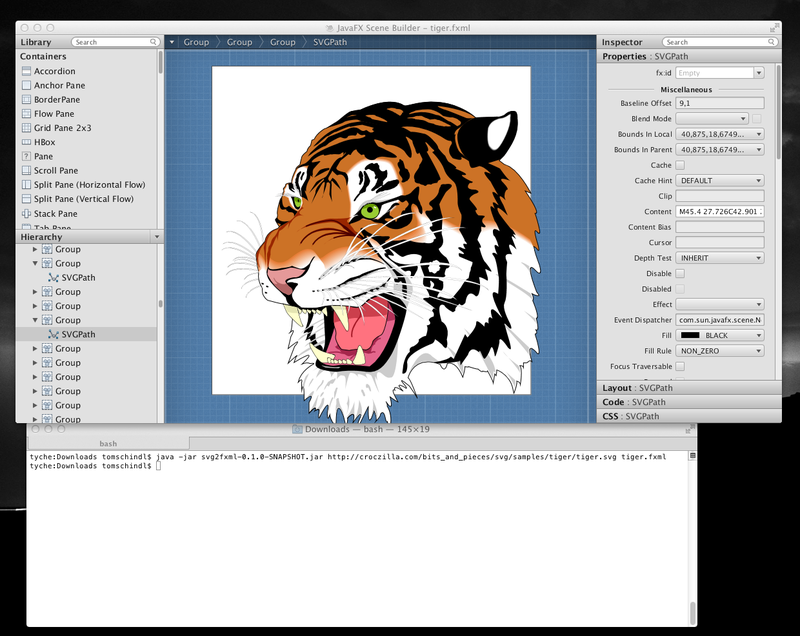 There’ve been some requests from people to use the SVG to FXML converter outside my e(fx)clipse project. I’m happy to announce that the latest nightly builds provide a standalone version of the converter. Need to teach myself now how I can provide this as a netbeans module 😉 Any volunteers to provide an implementation and contribute it to e(fx)clipse.org? Is there a way to use this jar api for generating a javafx.scene.Node without the fxml step ? no and the algorithms used are not optimized for live processing and creation of Scene-Graph on the fly. What is your use case, do you want to use it transform SVGs on the fly? Yes i would to load a svg file in javafx.scene.Node on the fly. What part of the svg specification if supported ? For example this complex svg (http://www.dehats.com/resources/vector-retina/Plant_cell_structure_svg.svg) is very well converted but this much more simple one(http://upload.wikimedia.org/wikipedia/en/6/6d/European_flag.svg) is not. I create this ticket http://efxclipse.org/trac/ticket/307 . Thanks for your help. Hello, have you improve this great utility ? Has anyone used this lately? I cannot access the repo or find this anywhere else on the web.